_____Photography students, beginners, and lovers of the no-nonsense, make-it-like-a-hockey-puck school of SLR camera design-- you can all relax. The late and much lamented ancient Volkswagen of all SLRs, the Pentax K1000, a victim of the rising manufacturing costs of all mechanical cameras as well as the lack of parts to make the camera beetle go, has been replaced. But it's been well replaced, and more than replaced. The only non-more feature is the price. While not precisely established at this writing, it will cost less than the K1000. _____Built on the far-handier-to-operate and more compact body of the modern day Pentax ZX-5n, ZX-50 and ZX-10, the manual-focusing ZX-M provides manual exposure setting with a precision and convenience the K1000 couldn't possibly approach. The finder has a brightly lit, manual-exposure +-3-stop LCD scale caribrated in half stops. That's a heck of a lot more accurate than a center-the-needle control in which top and bottom of the needle channel represent about a half-stop over- and underexposure (see drawing, left). _____But in addition to the required manual metering, the ZX-M gives you virtually all the automation of top-level SLRs-- program exposure comensation, depth-of-field preview, two-segment evaluative metering with FA, F, or A lenses (centerweighting with all other K-mount lenses), autoload, autowind, autorewind, DX coding ISO 25 to 5000 (manual ISO settings 6 to 6400), autoexposure shutter speeds 30 to 1/2000 sec, and manual speeds from 2 sec. _____The basic K1000 had no self-timer, no split-image rangefinder, flash sync to only 1/60 sec, no information in the finder except the meter cell that had a metering range of 3-18EV with a 50mm f/2 lens and ISO100 film. The all-mechanical shutter provided adequate but not great continuous accuratacy and the galvenometer activating the meter needle swing was delicate and could get out of adjustment if the camera was roughly handled. _____The ZX-M has a self-timer, microprism collar and split-image rangefinder, flash sync to 1/100 sec, a flash-OK signal in the finder as well as a full information finder LCD and LCD atop the camera body. It weighs 10.8 oz and its silicon cell has a range of EX 1-21 with a 50mm f/1.4 lens and ISO 100 film. The electronically controlled metal-blade shutter should remain highly accurate and the solid-state metering system is rugged. _____All, however, is not gain. 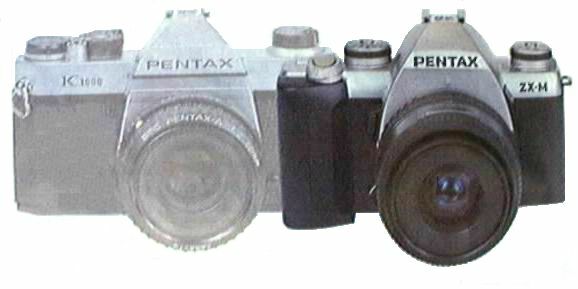 The all-metal K1000 had an all-glass prism finder with 0.88X magnification while the polycarbonate-bodied ZX-M (with metal focal-plane plate) has a visible smaller 0.77X mangnification. The ZX-M mirror-prism finder produces an image slightly less bright. The two CR-2 lithium batteries required to run the ZX-M are becoming widely available in the U.S., but they're still scarce overseas, while the K1000's mechanical 1 to 1000 sec shutter speeds need no batteries and the 1.5-volt button cell operating the meter is far more widely available than the CR-2. _____Some dyed-in-the-mechanical-camera enthusiasts will also point out that the traditional threaded cable-release socket within the K1000's shutter release is a lot cheaper to fill than the electronic cable switch socket on the left side of the ZX-M. However, an electronic cable switch provides far greater remote-control possibilities than a mechanical cable release. Another switch allows wireless release. _____The K1000 also has a PC flash terminal on the front in addition to its hot shoe, while the ZX-M has no PC terminal. However an accessory PC terminal adapter can easily be slipped into the ZX-M's hot shoe if required. _____Small carpings, we think, compared to the overall gains. But for those who adore the clunking sound of an all-mechanical, cloth focal-plane shutter, a heavy heft, sharply angled body contours, the mechanical thrust of a thumb pressing the wind lever, the annoyances of manual film threading, the delights of crank rewind, and cannot endure the thought of all the luxuries and conveniences heaped upon their heads in the ZX-M, a diligent search among camera shops may uncover a few last-ditch production K1000s. Yes, these later K1000s may have more plastic parts that those of earlier days, the lens may be made in Taiwan and the body assembled in China, but they are, as they say, what they are-- unadorned hockey pucks. However, if you have a ZX-M, you can learn more, shoot faster, and run photographyic rings around any K1000 owner, make no mistake about that!